Do you want to remove sugary drinks from your organisation? 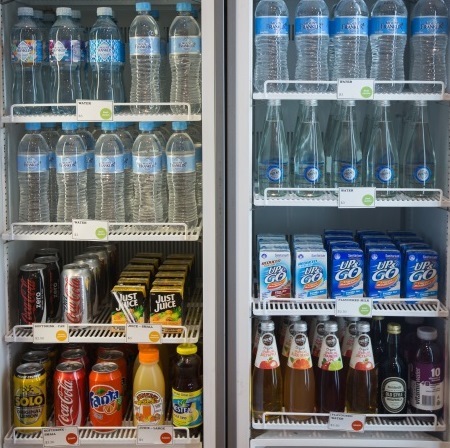 Many Victorian organisations, like health services and sporting facilities, have reduced or removed sugary drinks from their retail food outlets, vending machines, and/or catering. This is a common first step that many organisations take when implementing the Victorian Government’s Healthy Choices guidelines. Sugary drinks (or sugar-sweetened beverages) include all non-alcoholic, water-based drinks with added sugar. This includes non-diet soft drinks, energy drinks, fruit drinks (not fruit juice), sports drinks and cordials. These types of drinks contain a lot of sugar and excess kilojoules, with little to no nutritional value. They are also classified as RED (Limit), according to the Healthy Choices guidelines. Milk-based drinks and >99% fruit juices with no added sugar are not considered sugary drinks. Diet drinks and artificially sweetened drinks are also not considered sugary drinks. You can assess your drinks online or find out which drinks are classified as GREEN (best choices), AMBER (choose carefully) and RED using FoodChecker. With a bit of careful planning and commitment from key staff, reducing or removing sugary drinks is achievable and won’t negatively affect profit. Start by speaking to management to get their support. Present them with information on why your organisation should address sugary drinks. Outline the duty of care that your organisation has for the wellbeing of its staff, customers and/or visitors; the negative impacts associated with providing sugary drinks; and the benefits to your organisation if it reduces or removes them from site. You’ll also need to engage the people responsible for sourcing and supplying foods and drinks (such as contract managers, retail outlet managers, vending suppliers or catering providers) to learn more about any contracts or agreements related to the provision of drinks. Once you have commitment from your organisation, and you are aware of any contractual obligations, you can support the relevant staff to reduce or remove sugary drinks. Every organisation is different, so you’ll need to work out what the best approach for yours, such as reducing sugary drinks all at once, or reducing the amount of sugary drinks over time. Don’t be afraid to trial things for a few weeks or months to see what works best for your organisation before making a permanent change. including GREEN drinks in healthy meal deals. Reducing or removing sugary drinks will be most successful when you provide customers with affordable and attractive healthier options. There are a number of ways you can nudge customers and staff to make healthier drink choices by changing how drinks are placed, priced and promoted. 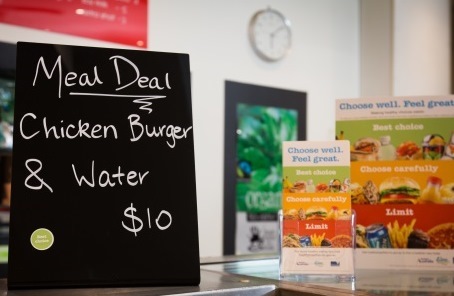 Learn more about how to promote healthy choices in retail food outlets here. And see VicHealth’s Healthy choice: the easy choice’ webpage for more examples and suggestions of ‘nudges’ you can try. Visit Rethink Sugary Drink for tips and resources to help you reduce or removing sugary drinks, including posters and a workplace e-kit. Or watch this free webinar, Reducing Sugary Drinks Availability in Sport and Recreation Centres. Presenters discuss ways sport and recreational environments can implement or maintain changes they have made to reduce sugary drink availability. The presentation celebrates the success of thriving organisations and offers practical tips and strategies for sport and recreational groups looking to reduce the availability of sugary drinks.